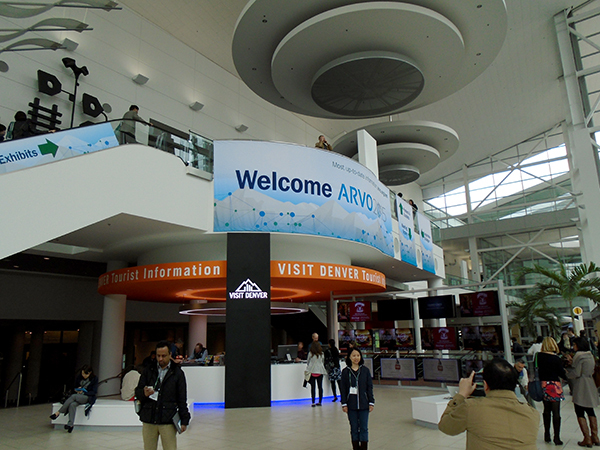 Prahatha Venkatraman and Yuk Fai Leung attended the 2015 Annual Meeting of the Association for Research in Vision and Ophthalmology (ARVO) in Denver, CO, from 5/3 – 5/7. 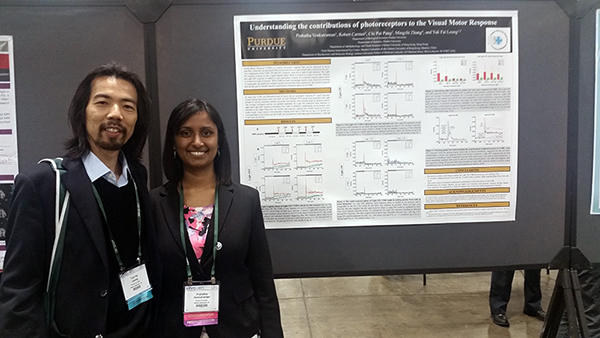 Prahatha presented a poster entitled “Understanding the contribution of photoreceptors to the visual motor response”. 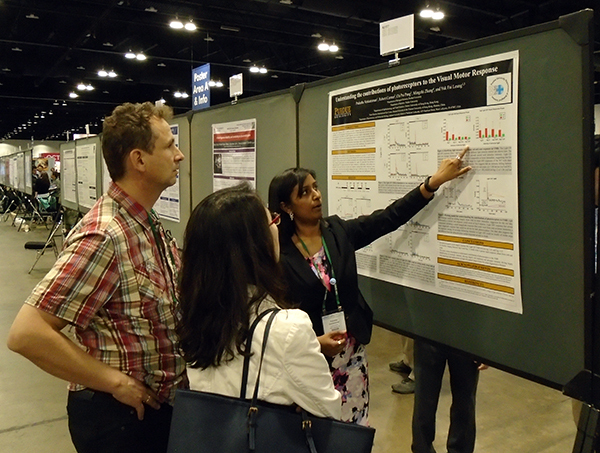 Prahatha presenting her poster to colleagues, including Dr. Stephan Neuhauss on the left. 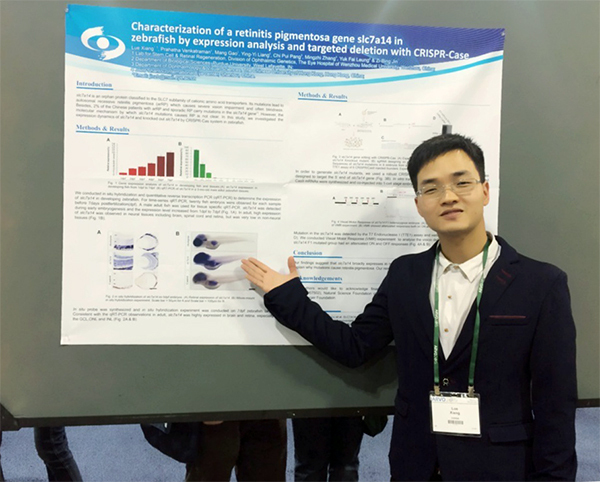 Lue Xiang, a former visiting scholar in the laboratory, also attended the meeting and presented a poster entitled “Charaterization of a retinitis pigmentosa gene slc7a14 in zebrafish by expression analysis and targeted deletion with CRISPR-Cas”. 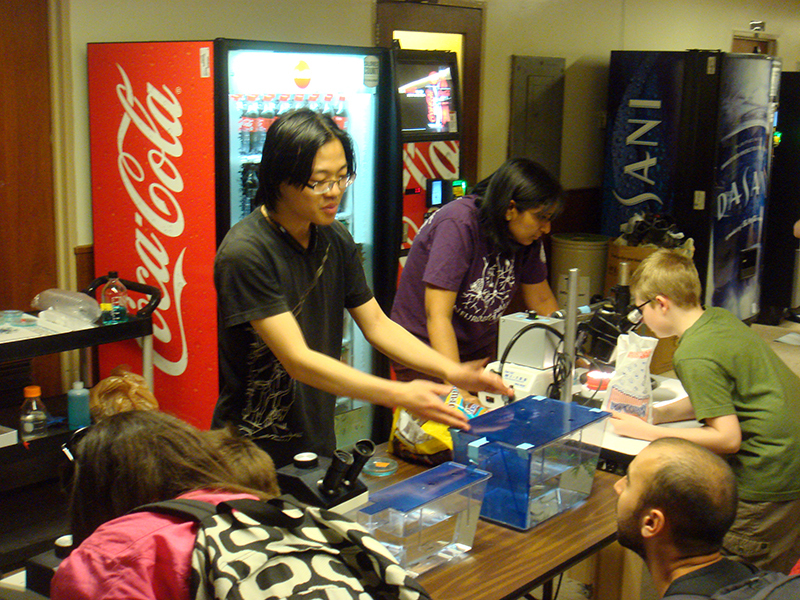 Posted by Yuk Fai Leung on May 12, 2015 at 10:33 PM under Fai's sharing, lab activities, News. and the reasons behind the OWS movement. Posted by Yuk Fai Leung on November 21, 2011 at 10:28 AM under Fai's sharing, News, science and society. Posted by Yuk Fai Leung on October 5, 2009 at 7:45 AM under Fai's sharing, News. 2009 Ig Nobel prize winners!!! REFERENCE: “Are Full or Empty Beer Bottles Sturdier and Does Their Fracture-Threshold Suffice to Break the Human Skull?” Stephan A. Bolliger, Steffen Ross, Lars Oesterhelweg, Michael J. Thali and Beat P. Kneubuehl, Journal of Forensic and Legal Medicine, vol. 16, no. 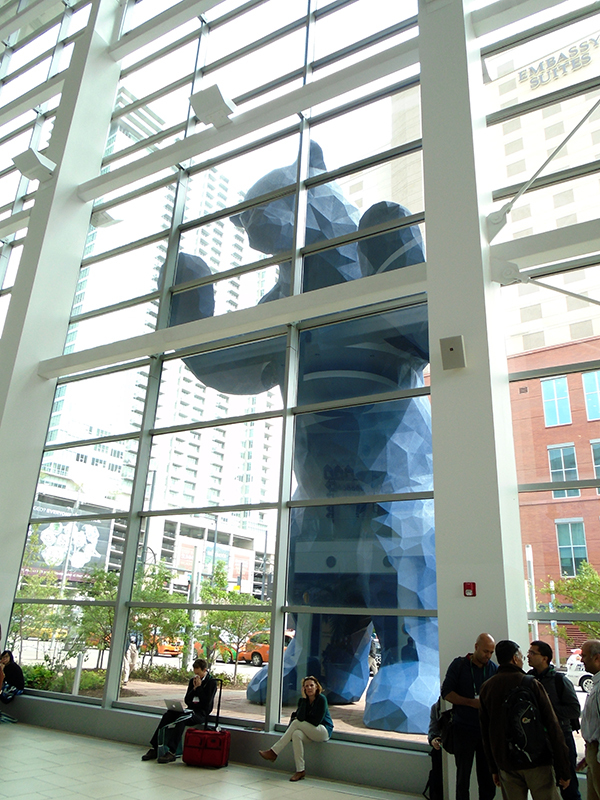 3, April 2009, pp. 138-42. Catherine Douglas and Peter Rowlinson of Newcastle University, Newcastle-Upon-Tyne, UK, for showing that cows who have names give more milk than cows that are nameless. REFERENCE: “Exploring Stock Managers’ Perceptions of the Human-Animal Relationship on Dairy Farms and an Association with Milk Production,” Catherine Bertenshaw [Douglas] and Peter Rowlinson, Anthrozoos, vol. 22, no. 1, March 2009, pp. 59-69. The directors, executives, and auditors of four Icelandic banks — Kaupthing Bank, Landsbanki, Glitnir Bank, and Central Bank of Iceland — for demonstrating that tiny banks can be rapidly transformed into huge banks, and vice versa — and for demonstrating that similar things can be done to an entire national economy. Donald L. Unger, of Thousand Oaks, California, USA, for investigating a possible cause of arthritis of the fingers, by diligently cracking the knuckles of his left hand — but never cracking the knuckles of his right hand — every day for more than sixty (60) years. REFERENCE: “Does Knuckle Cracking Lead to Arthritis of the Fingers?”, Donald L. Unger, Arthritis and Rheumatism, vol. 41, no. 5, 1998, pp. 949-50. Ireland’s police service (An Garda Siochana), for writing and presenting more than fifty traffic tickets to the most frequent driving offender in the country — Prawo Jazdy — whose name in Polish means “Driving License”. Gideon Gono, governor of Zimbabwe’s Reserve Bank, for giving people a simple, everyday way to cope with a wide range of numbers — from very small to very big — by having his bank print bank notes with denominations ranging from one cent ($.01) to one hundred trillion dollars ($100,000,000,000,000). REFERENCE: Zimbabwe’s Casino Economy — Extraordinary Measures for Extraordinary Challenges, Gideon Gono, ZPH Publishers, Harare, 2008, ISBN 978-079-743-679-4. Posted by Yuk Fai Leung on October 2, 2009 at 6:08 PM under Fai's sharing, fun, News. 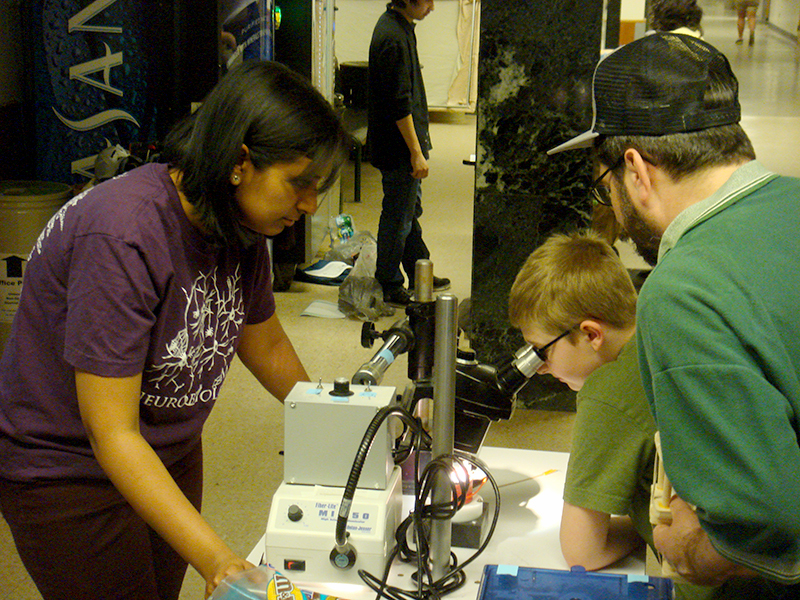 Why does Fai work late? Here is the scientific reason. Scientists have found out that night owls can work longer and be more alert late at night. As simple as that. Researchers found that in tests those who consider themselves more alert in the morning can concentrate for less time than those who work best at night. The results, reported in the journal Science, suggest that night owls generally outlast early birds in the length of time they can be awake before becoming mentally fatigued. Posted by Yuk Fai Leung on May 30, 2009 at 2:06 AM under News.